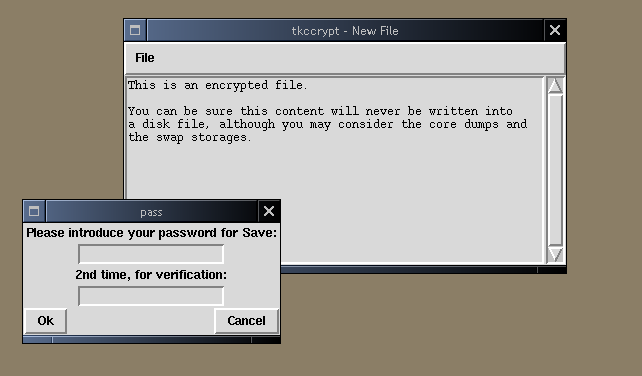 Tkccrypt is a simple frontend for editing small text files encrypted with Peter Selinger's ccrypt, written in Tcl/Tk. The program allows opening and storing only encrypted files, and it guarantees that the decrypted content is never written to disk. Its target audience is made up of users who don't feel confident using a console encryption tool, but need encryption for some text data. The dependency only on ccrypt and Tcl/Tk makes this program very easy to run on many Unix systems. Download the latest version (GPL licensed): tkccrypt.gz - 2006-11-01 (requires ccrypt in the PATH).